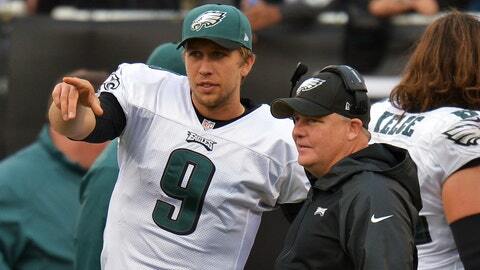 Apparently, Chip Kelly wants to be with Nick Foles (No. 9) past the year 3000. Nick Foles has locked up job security into the next millennium. Foles has led the Eagles (7-5) to a 5-1 record and a share of first place in the NFC East with the Dallas Cowboys since replacing an injured Michael Vick in Week 5. He leads the NFL in passer rating (125.2) and has thrown 19 touchdowns and zero interceptions. Foles lost the starting competition to Vick in training camp. But he’s been excellent in five of his six starts since Vick hurt his hamstring on Oct. 6. It wasn’t until Vick was healthy last week that Kelly officially made Foles the starter. Now, Kelly is ready to say Foles is the quarterback of the future. Kelly was joking, of course. His focus is on the upcoming game against the Detroit Lions (7-5). Foles certainly has strengthened his case to be the team’s quarterback going forward, but those decisions are for the offseason. The Eagles are right in the thick of the playoff picture, so questions about the team’s long-term plans are not Kelly’s priority. That explains his sarcasm. Then again, teams like New Orleans, Green Bay, New England, Denver and many others know who their starting QB will be next year. Hasn’t Foles earned the same security as Drew Brees, Aaron Rodgers, Tom Brady and Peyton Manning? ”As long as he can stay healthy. That’s what I’ve qualified it with all the time,” Kelly said. ”I don’t think anybody can predict the health of anybody. That is a reality. How many quarterbacks have gone down this season in the National Football League? It’s a pretty high amount. Foles is having an exceptional season. He tied an NFL record with seven TD passes in a win at Oakland on Nov. 3 and was the NFC’s player of the month for November. He broke Vick’s team record for consecutive passes without an interception and extended it to 233. He’s one TD pass away from tying Manning’s record set this year for most TDs without a pick to start a season. Despite starting only half the games, Foles has as many TD passes as Brady. There’s no telling what numbers Foles would have had he started the season as the No. 1 QB.